MoreBeer! designed the original stainless QD's for the brewing industry over 10 years ago. The same manufacturer has been machining them for us ever since. The design has certainly been copied but not with consistent quality. That is why MoreBeer! Stainless QD fittings have a near unanimous 5 star review. This will work with any of our H503 and H507 series of quick disconnects. 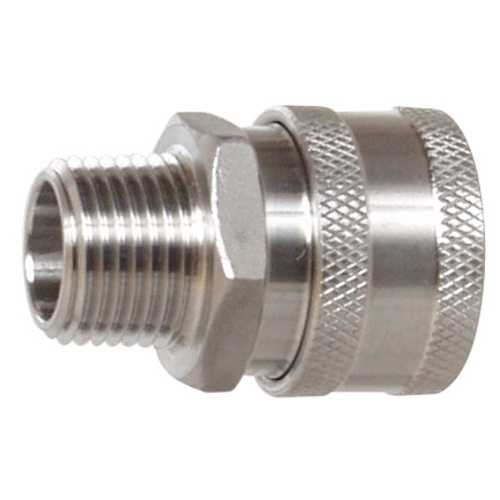 These feature a 1/2" Male National Pipe Thread on the end for easy connectivity to almost anything. The quick disconnect will hold pressure for typical brewing applications when moving liquids at 60 psi or less. 1/2" ID. Gasket temperature range is -40° to 250° F. Open port, does not have shut-off. The standard Quick Connect in homebrewing; good open flow, easy to connect and clean. BEST ANSWER: Yes, free flowing at all times. I have used these for connecting my boil kettle to a pump for whirlpool and transfer into my fermenter. Work great, don’t leak. But of course do need cleaning. Adding QDs can be expensive, but in the long run it is definitely worth it. These QDs are manufactured very well. I have purchased from other stores, but the quality is not the same. The whole unit feels solid and clean. Does the job very effectively!! What can you say about a plumbing fitting? It fits, it doesn't leak, it has an o-ring in it that is probably replaceable if it ever wears out. I use these Male and Female QDs throughout my brewery - Female on all the hoses, and Male on kettles, pumps, heat exchanger, and wort chiller. No leakage whatsoever. They're expensive, but a joy to use. All stainless Quick Disconnects I've purchased from MoreBeer have worked flawlessly. No leaks and easy clean up. Excellent "must have" equipment for all brewing! I build up my brewery different every time because I am always moving from apartment to apartment. These quick connects give me the flexibility i need! Don't go another day without switching to these quick connects! I have about 10 of these in use, overall a excellent product. Make sure you clean after use well to avoid sticking. One trick I have found that works is to use a spray bottle with San Star and give the inner ring a quick spray before connection, works well! I love the stainless and I expect them to last a long time for sure. These are threaded on all my kettles, mash-tun, pumps and chiller(s). I have several silicone hoses of various lengths with barbed/male fittings on either end and simply jack the hoses into these receptacles to quickly configure what I'm after - they're fantastic! I found a stainless quick disconnect that looked exactly like this one on another site for $12. That purchase turned into a $12 lesson in quality; the similarity was skin deep and the other unit was junk. The collar squeaked and creaked like the springs were re-purposed from discarded ballpoint pens, it was exceptionally difficult to connect to its male counterpart (which isn't fun when the male counterpart is on a hot brew kettle), and the o-ring buckled and came loose after the first use. Save yourself the trouble and aggravation - spend the extra $3 here for a top-quality product. Want to upgrade you Brew system and make life easy? Thats what we did when we practically replaced ever hose connections with a Quick disconnect. They feel great going on and off, and it make things very interchangeable for cleaning purposes, and quick installation and removal too. A must have for any Good looking Brew System. My neighbors and friends (even those that don't homebrew) rave about my quick disconnects. Very easy to use--one hand is all that is needed. It is much easier to transfer liquids between brew vessels when you use quick disconnects and the stainless ones are very simple to keep sanitary. These are helpful with whatever technique you use from SIMS to HERMS. Super easy to use and really enhances brew day. I generally clean these by soaking them in boiling water after brew day to get any residual sugars off. Makes connecting to the pump a piece of cake. After using CPC connectors for years I was happy to see these come out from More Beer. They will not break like their plastic counterparts and do not leak at all. I changed out all the plastic fittings on my 20 gallon system to use these connectors and been using them now for about three years. Yes they are pricey but these are the last connectors you will have to buy. I suggest you pick up some extra 0-rings just in case one has to be replaced. I have only had to replace one since I have had them. This was perfect for my tubing/pump/chiller setup. When brewing 20 gallons batches, you need to pump. Expensive investment, but you will only need to buy them once. I got a couple sets of these for my kettles and hoses. Going to get another set for my new 15 gallon kettle. 2 left to change out. I really like these. These mate well with QD and the machining is great. Smooth connecting to male and threads are clean and smooth. I have been purchasing one with each order until I have enough. High quality stainless steel QD. Works easily and flawlessly. Easy to to clean as well. I was reluctant to buy QDs for a long time since it is a fairly expensive upgrade to switch out all my hardware. I finally committed to it one day and am glad I did. It saves time and prevents messes. These are pretty heavy duty as well so I feel very comfortable using them and that they will last for a long time. These are bloody expensive parts but the quality and the functionality is great. The one thing I would warn people is that the rubber washer inside easily comes out. When this washer goes missing the part is useless. You can get a replacement part. Upgraded from the Kent plastic connector to this style, these have better flow. Better finish and easier to connect than steel camlocks. I'll be ordering more. A great addition to your brew equipment and well worth the small investment. Makes transfers easy. You'll find you'll want more than just one. These QD's are great! They simplify your brew day and make it more efficient through one hand operation for all on/off kettles, pumps and chillers or whatever. No more fussing with hose clamps and tools to attach and detach hoses. Definitely worth the investment. Time Saver!!!! I purchased this to install on my new 10 gal brew system. Upgrading from plastic and brass is always a good ideal for long-term use and better results. I would recommend this product for your system. Been using these QDs all over my brewery, as I am going all-stainless. Top-of-the-line gear. When the seals on my brass QDs started failing I used it as an excuse to upgrade them all to stainless. I'm very happy that I did. Great cheap stainless steel disconnects! These great disconnects are easy to use and clean. They are also reasonably priced. Commercial stainless steel disconnects are much more money. I keep adding these QDs to my brewery because I keep finding uses for them. They can be attached and removed with one hand, and they don't leak, period. Easy to clean and simple to install on any length of tubing. Bought several sets of these for use on my 4 vessel heat exchange/direct fire system. Got them with a March pump and enough silicone tubing to plumb it. The quick disconnects are a real treat to use. I'm just about to order some more. Recommended for all-grain brewers using pumps. Why would you use anything else but stainless steel disconnects? Easy to clean, quick to snap on/off, simple storage. They just make life simple and clean. This is the way to go to make your brew day a great day. I have had these on my brewery for over three years and haven't had to replace a gasket (o-ring) yet. I put the female ends on my kettle, mash tank, chiller and conical and the male ends on the hoses. They dont leak and are easy to plug and unplug. These MPT Stainless Steel Quick Disconnects make using a plate chiller so easy! They are not cheap but worth adding to your system. can't go wrong adding disconnects to your system. easy to use! highly recommend!